As strongly hinted by a faux fan letter published in last month's issue of Daredevil, the mighty Michael Allred will be drawing a one-off issue of the Mark Waid-written Marvel Comics series that ComicsAlliance named one of the best of last year. Speaking with USA Today, the Madman cartoonist said, "Daredevil is one of the first comic-book icons I was ever exposed to. I clearly remember hanging upside down on the monkey bars at recess and reading a Daredevil paperback." It's difficult to imagine a more Allred-esque image than that, and it's obvious that fans of the artist's bright, high-energy pop-art style will enjoy his work with the superhero originally created by Stan Lee and Bill Everett, and whose current series has seen similarly excellent work from artists including Marcos Martin, Paolo Rivera and Chris Samnee. Allred's artwork will appear in August's Daredevil #17. For more great Mike Allred comics, be sure to catch up on his and writer Chris Roberson's iZombie paperbacks in time for the Vertigo series' conclusion in August, and if you didn't know, Red Rocket 7 is one of the coolest comics ever and is available in a collected edition from Image Comics. 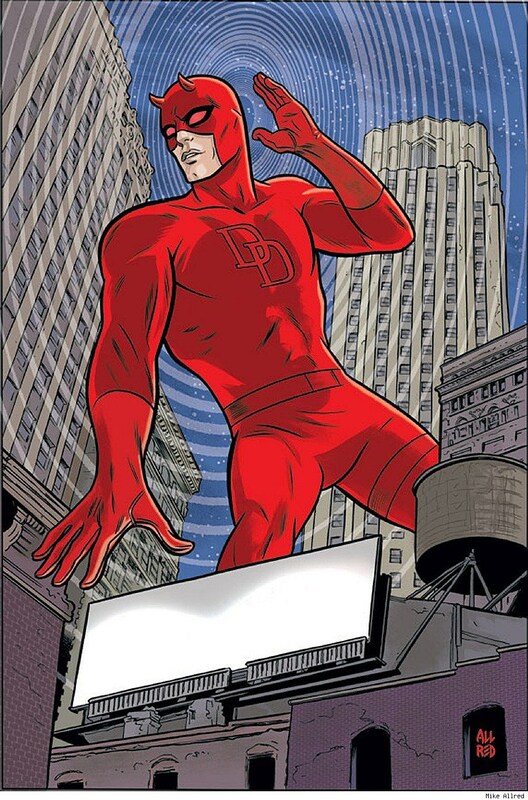 Click on to see Allred's full-size Daredevil illustration.